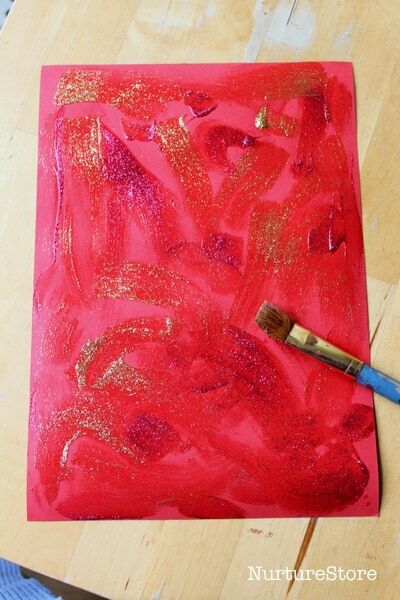 This Chinese New Year activity takes inspiration from the traditional colours of the festival for some sensory, process painting. 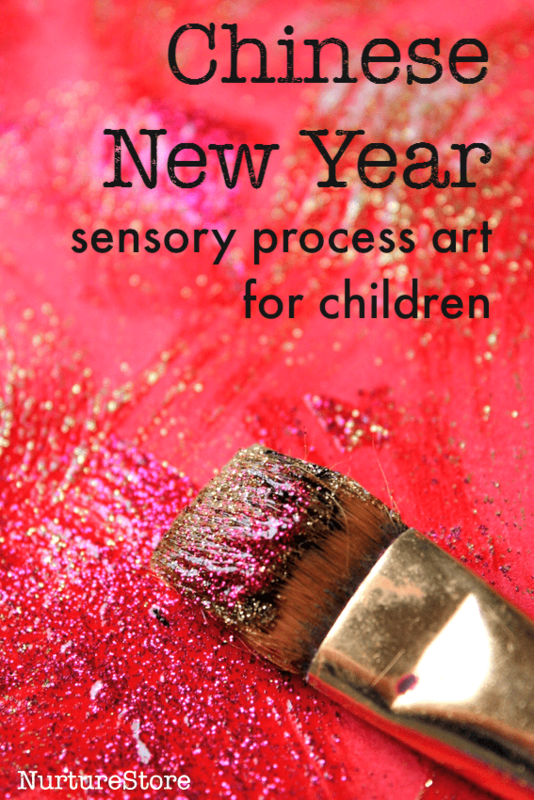 For a simple, sensory art activity to go along with Chinese New Year celebrations, we took inspiration from the colours of the festival to create some glittery pictures. Setting limits in the colours we use for an art activity can encourage us to explore different sensory aspects. For our Chinese-inspired art we picked a colour palette of just gold and red – traditional colours of the lunar new year festival. 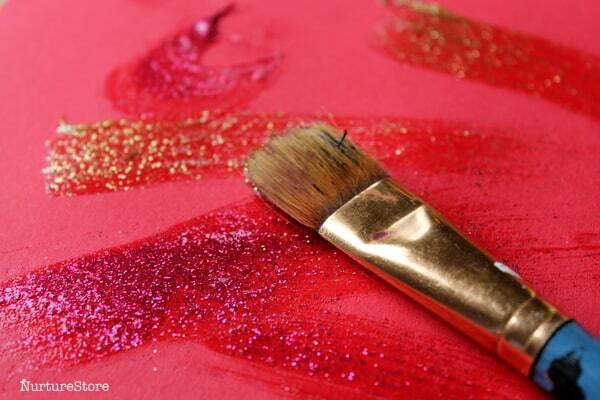 We used red card, and glitter glue as our paint, giving us the opportunity to focus on the feel and sparkle of the paint. 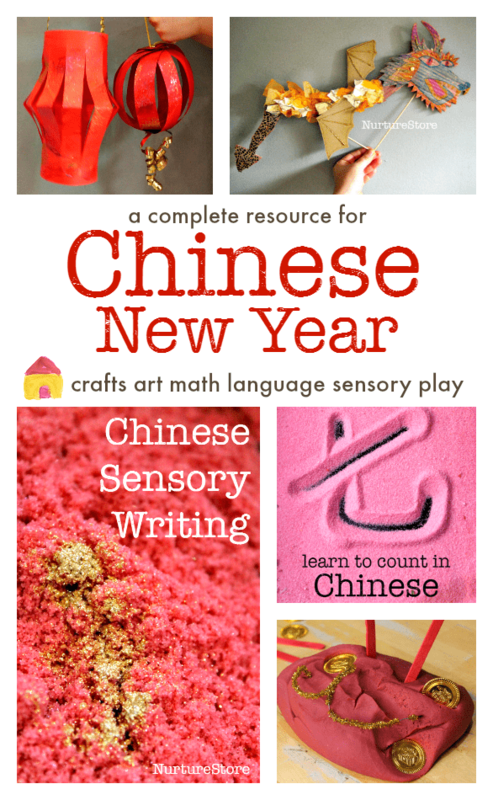 To introduce the activity you might take a look at photographs of Chinese New Year celebrations and talk about the colours and symbols that your children can see in them. What themes and similarities can they spot? You could also talk about other celebrations they are familiar with and see if they associate them with special colours. What colour is Valentines Day? What about Halloween? Or St. Patrick’s Day? Do they know why a festival has particular colours? With young children, process art is very important. This is where the focus of an activity is on the doing, not the end product. Here we are inviting our children to explore the materials on offer, to try them out, and create their own work of art. We’re not overly concerned how the picture turns out, and everyone can decide elements of the art for themselves. 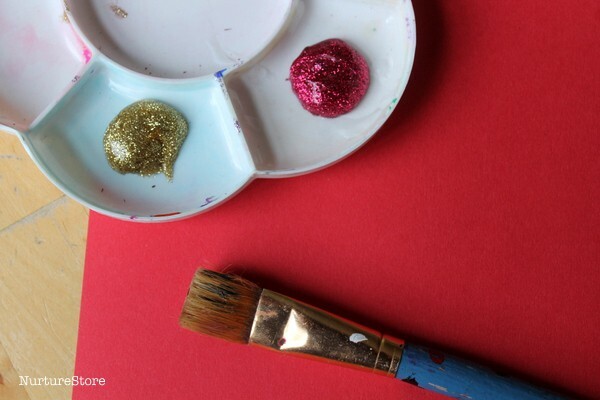 Your children might like to use paint brushes or fingers to paint. They could paint lines, blobs, swirls or swooshes. They can explore how the glitter glue feels. Is it the same as ordinary paint? How is it different? They might like to add in extra materials to their art work to create a collage. 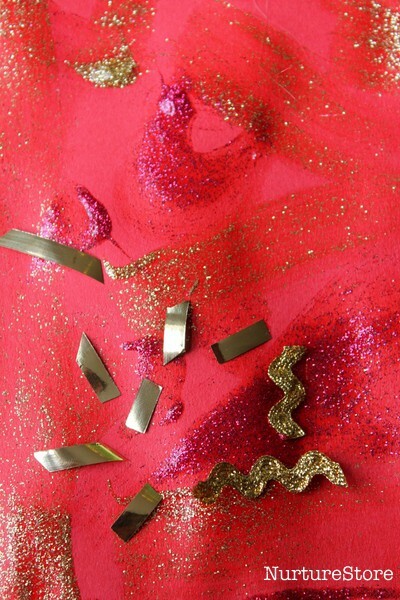 We found gold ribbon and ric rac in our craft supplies and used scissors to snip small pieces onto the wet glitter glue. Notice too how the glitter glue changes appearance as it dries.